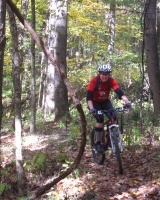 Favorite Ride: Mountain biking at MOMBA, it is flat, tight & twisty! I am different than most mountain bikers, I really don't like climbs. Why I Ride: I ride for many reasons - to get places, exercise, thrill, fun, and to help the environment.